Amarula Cream Unveils New Shape ‘Jabulani’ Bottle! Amarula Cream has taken another step towards cementing its reputation as a formidable global competitor with the launch of its new ‘Jabulani’ bottle. The bottle, which features sleek new curves and design elements including the shape of an African elephant etched into the glass, will be available in several sizes including 50 ml, 200ml, 350ml, 375ml, 700ml, 750ml, 1000ml and 1140ml. Because of the elephant etching, the brand marketing team named the bottle ‘Jabulani’, which is Zulu for ‘rejoice’. The inspiration for the name stems from the story of a rescued orphan elephant, named Jabulani, that was successfully reintroduced into the wild by South African conservationists. The Jabulani bottle will be launched exclusively to travel retail channels worldwide from mid-June followed by a phased roll-out into various domestic markets including South Africa, Europe and the Americas, later in the year. 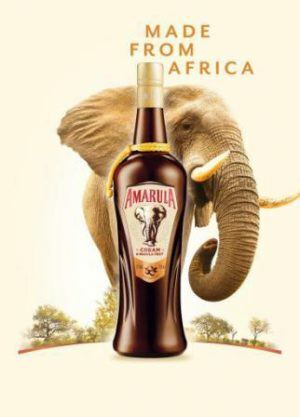 According to Distell’s Amarula Global General Manager, Dino D’Araujo, the new bottle design celebrates the brand’s most prolific icon, the African elephant, in a more evocative way. He said the team was delighted with the new premium Amarula bottle. “The African elephant has always been closely associated with the brand and, together with our designers, we were delighted to be able to incorporate the shape of the elephant directly onto the glass. “The bottle also reflects our ongoing commitment to elephant conservation. Since 2002, the Amarula Trust has helped conservationists study elephant behaviour and use the learnings to protect elephants within South Africa’s borders. “This year, we are extending our support into the rest of Africa thanks to a partnership with Wildlife Direct and its Kenyan CEO, Dr Paula Kahumbu. “Funding generated from the proceeds of Amarula sales around the world, combined with the expertise and commitment of Paula and her team, will help us continue to protect the continent’s elephants who are such an important part of both Africa’s heritage and Amarula’s story. Amarula Cream is a product of Distell. Amarula Cream is made from the exotic Marula fruit that is only found in sub-Equatorial Africa. The fruit grows only from the female Marula trees, which bear fruit just once a year at the height of Africa’s summer. Elephants – Africa’s gentle giants – travel from far to feast on the ripe Marula fruit, attracted by its exotic aroma. The size of a small oval plum, the Marula fruit ripens to a rich yellow, with a tough outer skin surrounding its fibrous, yet juicy, white flesh. Interestingly the Marula fruit contains four times more vitamin C than the average orange. The fruit is hand-harvested by the local communities and the inner flesh pulped and distilled to make Marula spirit. The spirit is matured for two years in French oak barrels. It is this aging process that naturally imparts the characteristics of vanilla and caramel into the spirit from the wood. Once aged, the Marula spirit is infused with a rich velvety cream. Amarula is the embodiment of ‘Africa in a Bottle’, and the inspiration that is derived from the natural beauty of Africa’s wildlife and the cultural richness of its people. These are the first steps of Amarula’s journey, whereby a little piece of Africa is bottled and transported around the world. Discover more about Amarula at www.amarula.com. At three months Jabulani was abandoned by his herd. Lente Roode, founder of the Hoedspruit Endangered Species Centre in South Africa, discovered the calf and took him in for help at her centre. Over the years, Jabulani adapted to the ways of his human friends, thinking of himself as one of us though in reality he needed his own kind. As a five-year-old bull, an opportunity arose to give him a family of his own kind. A herd from Zimbabwe had to be relocated to South Africa to ensure its survival. The rescue mission was launched by Lente and her team with the hope that Jabulani could be integrated into this new herd. When the time came to introduce Jabulani to the herd everyone was anxious, however to everyone’s relief the matriarch of the herd Tokwe wrapped her trunk around his head and placed her trunk in his mouth, a sign that she had adopted Jabulani as her own and that he was now part of their family. Camp Jabulani Safari Lodge, located within Kapama Game Reserve in Hoedspruit, was so named after Jabulani by the owner Lente Roode. WildlifeDirect is a non-profit conservation organisation based in Kenya. In the few years that WildlifeDirect has existed, it has been at the frontline in bringing attention to otherwise ignored conservation areas. Its CEO, Dr Paula Kahumbu, is probably best known as one of the protagonists of the highly successful ‘Hands off our Elephants’ campaign (the other is the First Lady of the Republic of Kenya, Margaret Kenyatta). Her critical role in popularising this campaign resulted in a special commendation at the United Nations Person of the Year celebrations in 2013, as well as the Presidential Award and title of Order of the Grand Warrior (OGW) from the President of Kenya, Uhuru Kenyatta, in 2015. In addition, Dr Kahumbu is the producer of Kenya’s first wildlife documentary series made by Kenyans, NTV Wild; and is the recipient of the Whitley Award 2014, donated by The LJC Fund in memory of Anthea and Lindsey Turner; the National Geographic Howard Buffet Award 2010 for conservation leadership in Africa; and is a National Geographic Emerging Explorer. Young KZN Ceramicist launches collection at Constitution Hill! The World’s Top-selling Cider Launches In SA!